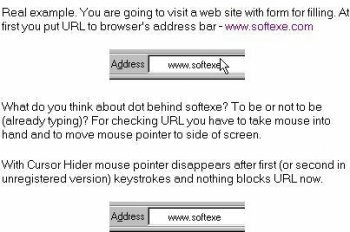 Cursor Hider program hides the mouse cursor while you are working with keyboard. Cursor hides two keystrokes after. Move mouse and mouse cursor will show on screen. See tray icon (arrow) for status cursor: is on - arrow is white, is off (invisible) - arrow is transparent. This programs actually works and does what it claims to do very well. Small, simple and effective. It is actually extremely useful for a HTPC where you wnat the mouse pointer to remain hidden, but be there just in case you need to perform some maintenance. Although it is not worth $15 IMHO, you cannot blame its authors from trying to get some money back out of it. Pity they got the price wrong; I would not mind paying $2 or $3 for a streamlined version with only the mouse hiding function. I've always found it annoying that the mouse cursor remained on the screen when I started using the keyboard. This functionality should have have been built in to Windows in the first place. No, I am not willing to pay $15 for it, but I would use it if it were freeware or under $5. Well, I guess I'll add my 2 cents. I cannot try this version because I don't have Win2000 yet, but I am a registered user of the 4.x version of the Win95/98/NT release. I love it, and confirm it is the best media app out there. I have also tried them all, and decided on purchasing this one. Terrific software. Top quality app, I must say. An all in one app with horsepower. The best one, for sure! Killer software!!! I would like to also thank you all for the information and reviews. I might not have tried it if not for your notes. I have used it to play all my audio and video, setup playlist, rip CDs, conversions, and more. I agree that this app is the best all-in-one out there. Thanks for carrying it, FileForum! Way cool app! Thanks all for the tip. This one is incredible. Wow! Thanks for the tip, dnswilson, this app is awesome! This is the best app I have tried too! I disagree with the last post, actually. This application is the best all-in-one solution, in my opinion, and I have tried them all. The video playback is great here! I like the way you have complete and flexible resize control. Also, it has more than any of the other all-in-one packages I have found. Supports all formats, playlists of both audio and video, and all the great audio conversions! I rate this one a definite 5! 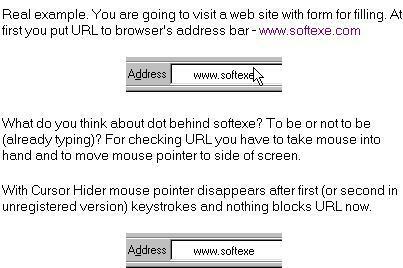 And the purpose of a disappearing mouse cursor is?? Why use a program that takes up memory when you can just move the cursor to the edge of the screen?